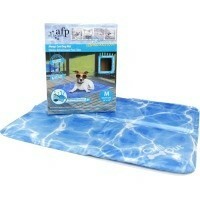 AFP Chill Out Always Cool Dog Mat is a brilliant solution for keeping your dog cool on a baking hot summers day. The mat has a special lining filled with a cooling gel that keeps the surface of the mat cold even in hot weather and does not require refrigeration to maintain. Easy to use: simply lay the mat down on a flat surface, sit back and watch your dog lay down on the mat and chill out.